Intravenous (IV) infections are a major cost-centre for any hospital. It causes higher mortality rates in patients, loss of productivity and less quantifiable costs. The main causes are non–protocolised processes, lack of infrastructure, technology, and overcrowding. The risks of antibiotic-heavy patient maintenance leads to many resistant strains and are getting difficult or impossible to treat. However, a large proportion of IV infections are preventable. For example, CRBSI is a serious threat. This is the most expensive HAI incidence and has a mortality rate of 25 per cent. In US, the cost per CRBSI is Rupees 32 lakhs per incidence. The rates of CRBSI in India is higher than the global average (In ICU it is 7.57 per 1000 catheter days). With implementation of the CDC-IHI Bundle & CDC-INS recommended practice adoption of CHG impregnated dressings and ‘Scrub the Hub’ protocol, infections can be significantly reduced. Healthcare-acquired infections or Hospital - Acquired Infections (HAIs) are the most common complications of hospital care, leading to high morbidity and mortality. While the World Health Organization (WHO) estimates about 7-12 per cent HAIs burden in hospitalised patients globally. The figures from India are alarming, with an incidence rate varying from 11 per cent to 83 per cent for various kinds of HAIs. Intravascular catheters access has become a very common practice in the hospital and outpatient settings for various purposes, including haemodynamic monitoring, renal replacement therapy, nutritional support, medication administration, the administration of fluids, blood products, nutritional solutions (parenteral therapy). A central venous catheter is a catheter whose tip resides in a central vein, whereas the tip of peripheral venous catheter does not. Central venous catheter and central line are used interchangeably. A long-term central venous catheter is a central venous catheter that is intended to remain in place for a prolonged period of time; it is either tunnelled subcutaneously between the percutaneous exit site and the site of vein entry, or it is fully implanted with a subcutaneous chamber that has a rubber surface which is accessed by a non-coring metal (Huber) needle. A short-term central venous catheter is intended for temporary use and it is neither tunnelled subcutaneously nor fully implanted. Catheter-related Bloodstream Infection (CRBSI) is defined as the presence of bacteremia originating from an intravenous catheter and accounts for 10 per cent to 20 per cent of hospital-acquired infections in the UK and is associated with both increased ICU stay and mortality. It is one of the most frequent, lethal, and costly complications of central venous catheterisation. The most common cause of nosocomial bacteremia the incidence of CRBSI varies by type of catheter, frequency of catheter manipulation, and patient-related factors, such as comorbidity and severity of illness. A recent review by Maki of over 200 published reports found estimates of incidence and incidence density of CRBSI to vary between 0.1 per cent and 22.5 per cent and between 0.1 and 2.7 per 1000-line days, respectively, by catheter type. Several factors are responsible to participate in the pathogenesis of catheter related blood stream infections. The catheter itself can be involved in 4 different pathogenic pathways like colonisation of the catheter tip and cutaneous tract with skin flora; colonisation of the catheter lumen caused by contamination; haematogenous seeding of the catheter from another infected site; and contamination of the lumen of the catheter with infusate. Potential risk factors for catheterrelated blood stream infections include underlying disease, technique of catheter insertion, site of catheter insertion, for example, femoral vs jugular vs subclavian site, duration of the catheter and purpose of catheterisation. The administration of parenteral nutrition through intravascular catheters increases risk of catheter-related blood stream infections. Risk factors, such as poor aseptic technique at the time of insertion, catheter manipulation, occlusive dressings, moisture at the exit site increase the risk of bacterial colonisation in the pathogenesis of catheter related blood stream infections. Earlier the belief was that hub contamination resulting in intraluminal catheter and subsequent bloodstream infection occurred exclusively in long-term central venous catheters. More recently, hub colonisation and intraluminal migration of infection has been recognised to be a common cause of both short- and long-term central venous catheters. Unusual causes of CRBSI are intrinsic contamination of infusate and haematogenous seeding from distant infection. The different microbiologic criteria of the CRBSI and CLABSI (central line-associated blood streams infection) definitions reflect the different purposes for which each was developed. The CRBSI was developed for use in research investigations of the risk factors and pathogenesis of bloodstream infections complicating vascular catheters in which it is critically important to establish a standardised, objective, unequivocal outcome. The CLABSI was developed for surveillance of health careassociated bloodstream infections in non-research settings in which standardised, objective, unequivocal outcomes are not available due to differences in the diagnostic laboratory investigations requested by different providers and therefore CLABSI was developed to serve as a surrogate measure of CRBSI. • same organism recovered from a quantitative percutaneous and a catheter lumen blood culture, with 3-fold greater colony count in the latter. CRBSI means a patient with an intravascular catheter has at least one positive blood culture obtained from a peripheral vein, clinical manifestations of infections (i.e., fever, chills, and/or hypotension), and no apparent source for the BSI, except the catheter. Early diagnosis and treatment are vital to reduce the morbidity and mortality involved. Different measures have been recommended by various guidelines i.e., CDC, INS, SHEA, IHI etc. to reduce the risk for CRBSI, including use of maximal barrier, effective cutaneous anti-sepsis, and preventive strategies based on inhibiting micro-organisms originating from the skin or catheter hub from adhering to the catheter. New technologies as per the updates CDC Guidelines -2017, Use a chlorhexidine-impregnated sponge dressing for temporary short-term catheters in patients which have been shown to reduce the risk of CRBSI. Catheter-related bloodstream infections are costly complications of hospital care that have occurred with greater frequency in ICU settings. Accurate diagnosis can be established by culture of appropriately collected specimens of blood and catheter tips. Evidence-based guidance is available to inform antibiotic treatment and catheter management when infection occurs. Risk of CRBSI can be reduced by optimising catheter selection, insertion and maintenance, and by removing catheters when they are no longer needed. The process of vascular infection prevention is complex, ongoing and can involve several care providers from catheter insertion through removal. Nurses are often the best positioned clinical team members to help reduce infection risk. Whether you are an experienced infusion nurse specialist or new to your role, there are many ways we can all help curb CLABSI at the bedside. It can be difficult to specifically pinpoint what triggered a bloodstream infection. That’s why personal accountability to following protocols for every atient, every time, is critical. Adoption of evidence-based CRBSI preventive practices remains low, despite data showing bundled approaches can specifically reduce CLABSI risk. In a U.S. hospital survey, about 25 percent of respondents indicated they are not routinely following the recommended best practice of using maximal sterile barrier precautions during central line insertion or using Chlorhexidine Gluconate (CHG) as a site disinfectant, according to the Centers for Disease Control and Prevention's (CDC) 2011 Guidelines for the Prevention of Intravascular Catheter-Related Infections. It’s important to stay focused on your infection prevention goals and recognise that your actions can make a big difference in protecting your patients. Adhering to all recommended evidence-based central line insertion practices is critical. In addition, don’t forget about the other recommendations from the Institute for Healthcare Improvement’s (IHI) central line care bundle. These include hand hygiene, allowing the skin antiseptic to dry before catheter insertion, optimal catheter site selection that avoids the femoral vein in adult patients and daily review of the line necessity, with prompt removal of any unnecessary lines. Several industry associations and governing bodies provide evidencebased standards, best practice guidance, useful toolkits, and scientific meetings to help you stay up to date on the latest recommendations for preventing intravascular catheterrelated infections. When major guidelines and clinical standards are published, it’s a great time for nurse leaders to revisit and refine vascular access policies and procedures, identifying new clinical data and innovative technology advancements that can help ensure your facility is compliant. 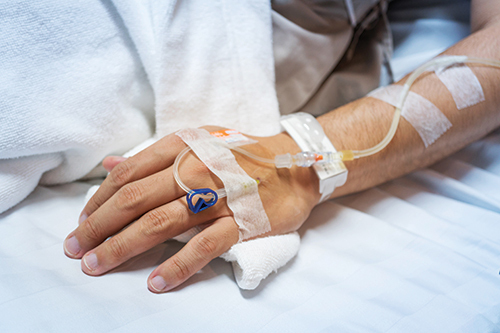 One of the most widely used resources comes from the Infusion Nurses Society (INS), who recently issued revised standards published in the January/February issue of the Journal of Infusion Nursing. The 2016 “Infusion Therapy Standards of Practice” features the latest body of evidence in vascular access, including updates related to the expanded use of CHG, passive disinfecting caps and dressing securement to prevent dislodgement. 3Mark your calendar too - we’re anticipating the CDC to release updates soon, hopefully later this year. the necessary maintenance tasks due to time constraints, ask for help. For example, trusted supplier partners can suggest innovative solutions and tools to help enhance efficiency, consistency and compliance, along with clinical support to help implement and audit new techniques, technology and training. When a CLABSI occurs, participate in your facility’s version of a ‘root cause analysis’ to help identify ways to increase best practice adoption and further refine your protocols. Advocate for implementing any identified changes as swiftly as possible, leading by example. Even though process change can be difficult, you can feel good that you’re doing everything you can to reduce infection risk for your patients. Finally, encourage a culture where accountability can be safely voiced, and openly received - promoting teamwork and safety for all. When your facility has achieved a major CLABSI-free milestone marker, take time to celebrate. Celebrations as simple as a pizza party, certificate or giveaways of CLABSI reduction swag (like tote bags, t-shirts and mugs) can go a long way towards renewing the team’s commitment to achieving even more days CLABSI-free. This pause to acknowledge your ‘village’s’ success can also help reinforce everyone’s commitment to evidence-based best practices and overall cultural change within your unit and across your facility. Ninad Gadgil is Country Business Leader for the 3M Health Care Business in India and Sri Lanka with products being sold in the Hospital, Dental, Medical device, Food Safety and Drug Delivery markets. He is also a member of the Management Committee of 3M India. Ninad Gadgil has 23 years of industry experience and has been working with 3M India for over 20 years. Apart from various positions in Healthcare, he has also been responsible for Marketing Excellence, Sales Excellence, Six Sigma, General Management, New Business Model Creation, Business development and Strategic Planning for the company.